Lobster grilled cheese, Philly cheese steak, pizza, pulled pork sandwiches, empanadas, tacos, dumplings, curry, fried anchovies………..it didn’t stop! 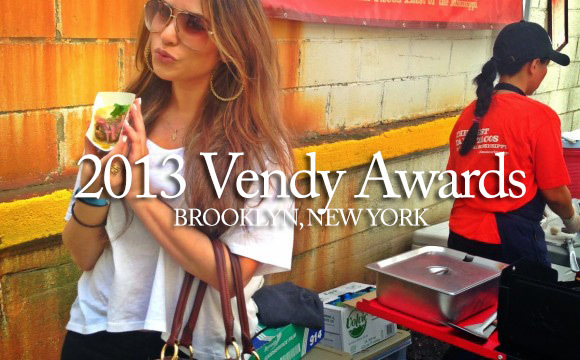 My sister and I attended the Vendy Awards in Brooklyn a couple weeks ago-also known as “the Oscars of street food”. The Vendy Awards is a food truck competition that identifies and celebrates NYC’s best street food vendors, fundraising to support the nonprofit organization, Street Vendor Project of the Urban Justice Center. I had a press pass and got to try all the best voted food trucks in New York City. Let’s just say I couldn’t move afterwards. I wish I had a bigger stomach to try everything but I only could fit so much in there lol. A little overwhelming for someone like me who wanted to try everything, but there was just too much. Not going to go into detail in this post about all the amazing food, I just more want to let everyone know about this awesome event. I was in food blogger heaven! Please note: I labeled each food truck with the corresponding pictures above. Stephanie – Thanks for giving us more initomarfon. Please pass on our warmest admiration for Mike. It’s great to read a bout a true role model these days. Thanks again, Stephanie, and I’m sure you are right about your father!